Our tours of Tsukiji Market are very popular at the moment. Especially as it has been officially announced that the jōnai, wholesale seafood market, will move to Toyosu in November of 2016. Many of our customers are sushi aficionados and are intimately familiar with seasonal sushi. They not only know the names of Japanese seafood, but also can recognize it in the market as we walk through. There is a bookstore at Tsukiji Market that sells food magazines and a variety of cookbooks and books on sushi. A handful of them are in English, including my book, Food Sake Tokyo, published by The Little Bookroom. 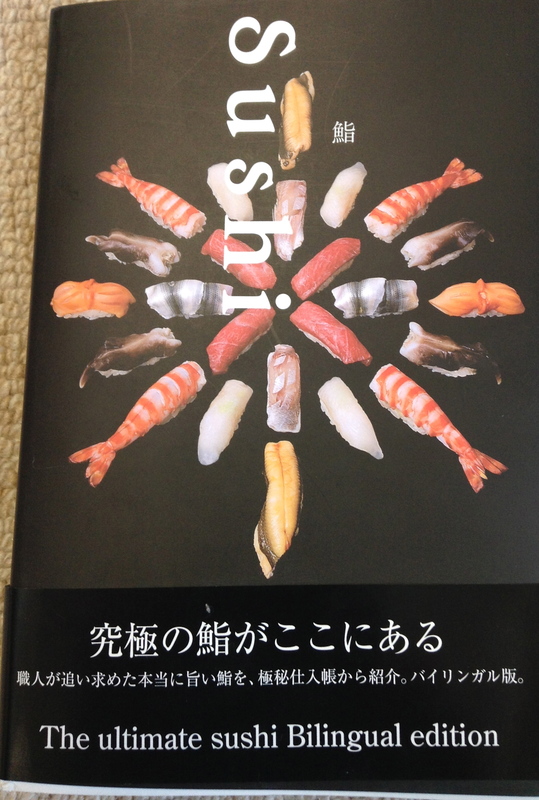 A popular sushi book with our clients is the bilingual edition of Sushi, by chef Kazuo Nagayama of Daisan Harumi Sushi 第三春美鮨 in Shinbashi. 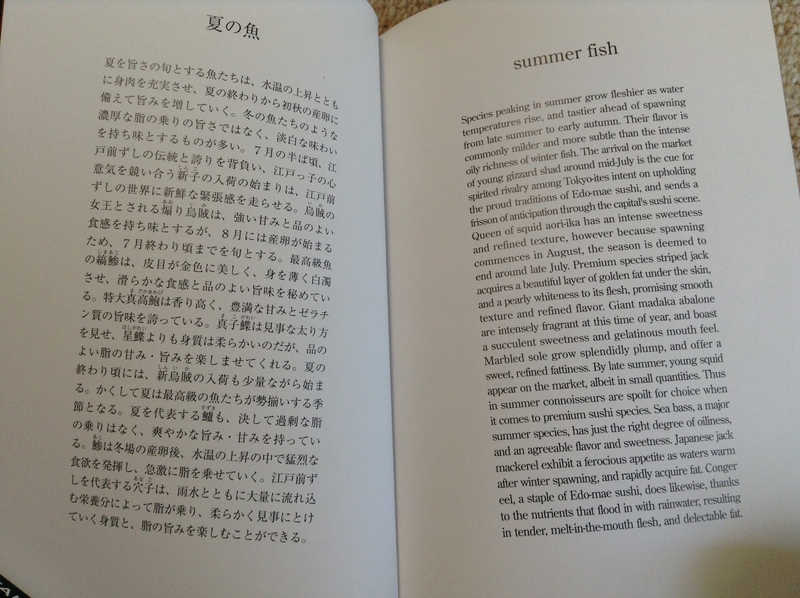 The book is a reference tool for seasonal sushi. 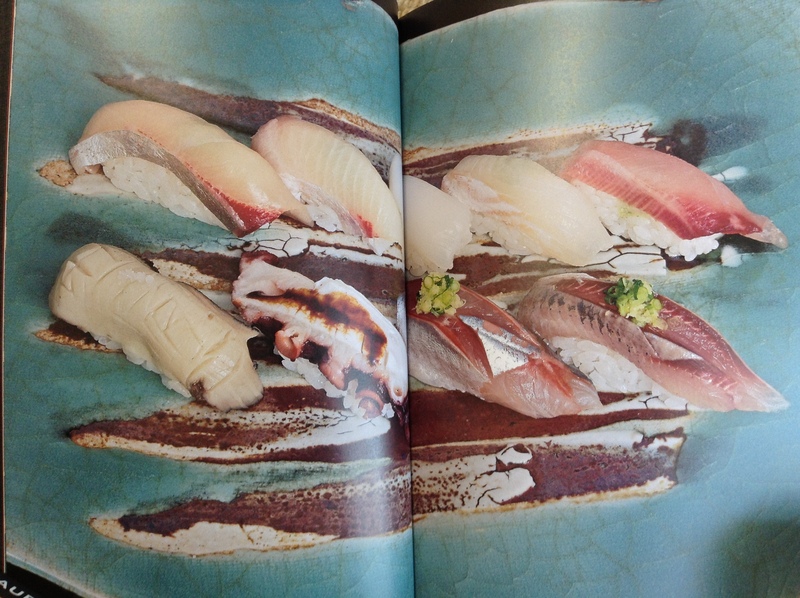 The book is divided into the four seasons and seasonal seafood is shown as nigiri-zushi on the left page. 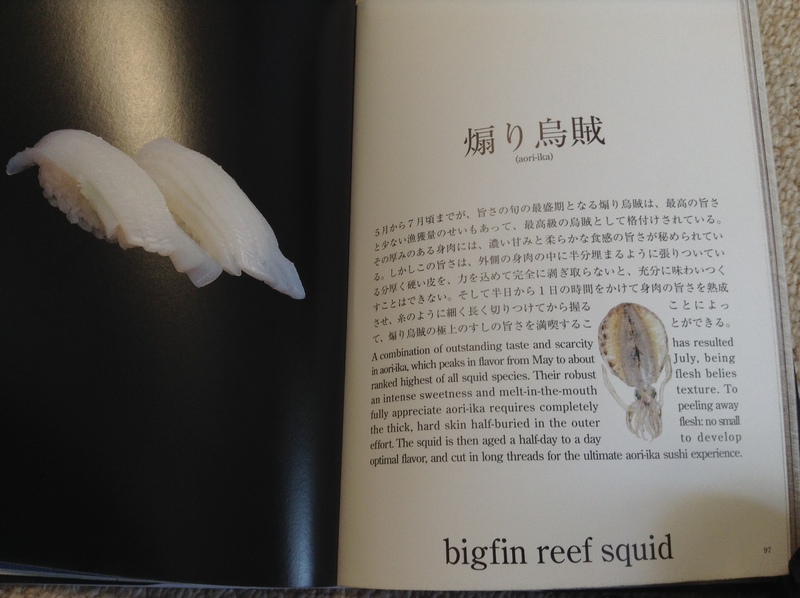 The right page has a sketch of the seafood as well as a well-written description in English on everything from the flavor, how it is prepared, aging, and much more. As it is also written in Japanese, it is a great guide to bring to the sushi counter when dining out as the sushi chef or staff at the restaurant can also read from the same guide. Even for readers who will not make it to Japan, this is a fun armchair reading as the descriptions are very detailed and informative. Particular bays of water are mentioned, something any sushi chef would be impressed by. The book also talks about the liver, ovaries, and other parts of the seafood that can be consumed at the sushi counter. The photography and design of the book is lovely. This photo shows the filets of summer seafood. On the upper right corner you have iwashi (sardine), noted for its row of dots. 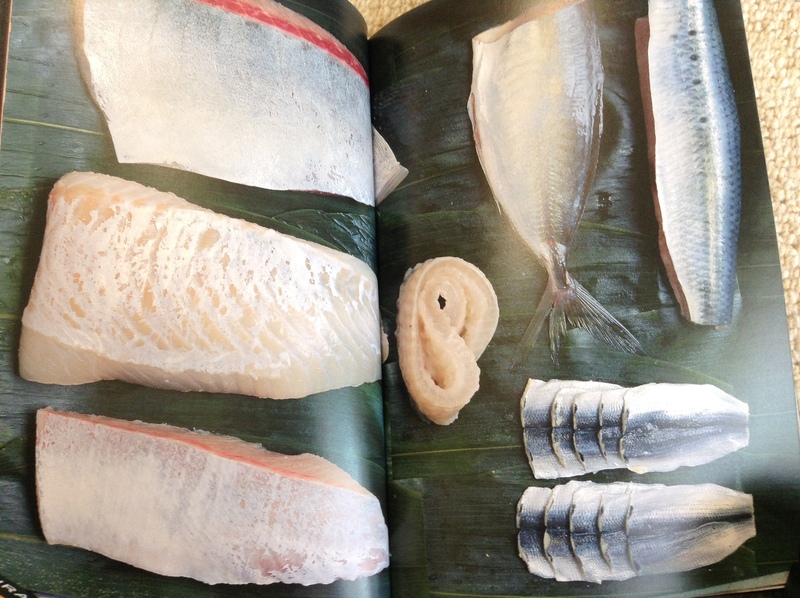 To the left of it is aji (Japanese jack mackerel per the book). On this page you have the nigiri-zushi of the filets from above. The iwashi and aji are the two fish on the bottom right. Each chapter begins with an essay on the season and what to look for when visiting the sushi counter that time of year. The last section in the book is dedicated to maki-mono (rolls). Sushi will be a welcome addition to any bookshelf. At 2,000 JPY, the 207-page book is a good value. What is the name and location of the bookshop in Tsukiji? Can the books you mentioned be found at other book shops such as Kinokuniya? Kinokuniya should have it. Call before you go. In my last tour with Yukari-san, we stopped by the bookstore and I picked up a similar bi-lingual sushi book. On my long flight back home, I simply devoured the book. Definitely a must have for sushi fans!! I will put this one on my wish list! Can’t wait for my next trip to Japan! You are very kind! These books are full of so much information, they are hard to put down. My next trip to Japan seems so far away… but I must absolutely remember to buy this book! Not only a delight for a gourmet, but from what I see an extraordinary Japanese learning help! Thank you so much for recommendation. You’ll enjoy this book. I also hope you have a copy of my book, Food Sake Tokyo, published by The Little Bookroom.